So, over at Paper Issues this month, we are celebrating Halloween all month long! If you spend any amount of time with me, you will know that I *don't* really like Halloween. Love fall. Hate scarey! So I have really had to make myself get into my scrapbook room and play with this theme! 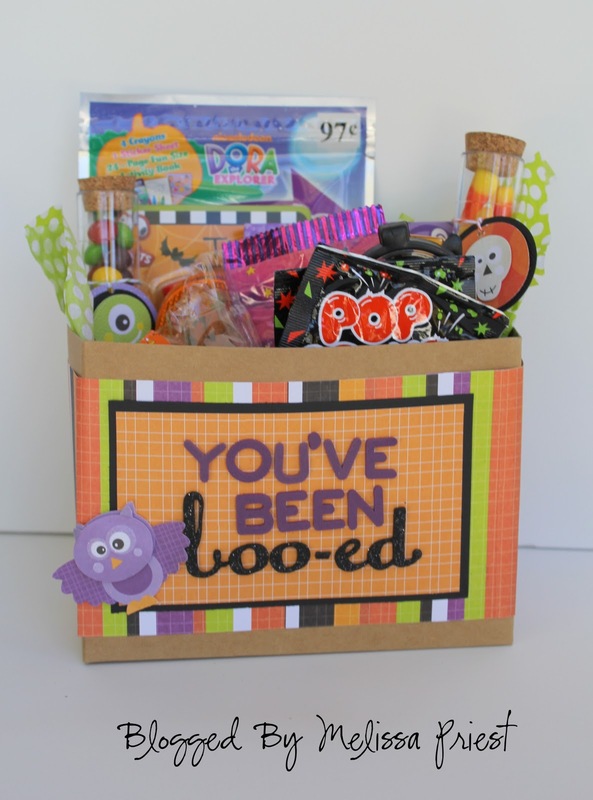 While on a trip to Target, I was inspired to make the little neighbor girl a 'you've been boo-ed' box, full of candy and treats. It was simple to do, required very little supplies, and is bound to be a hit with Tyler, our neighbor friend. John actually helped me a bunch of this project - he chose the paper and the little owl embellishment. Turned out pretty good, if you ask me! Tomorrow I will be sharing a frame that Ben and I made together - its been fun working with both of the boys on Halloween projects! We should definately get creative together more often!